In the video, Bruce mentions a big announcement. This is amazing! 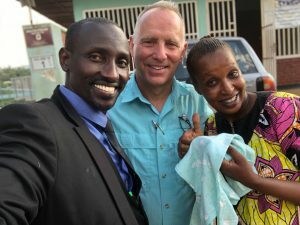 For seven years, Bruce has discipled the pastors of Rwanda. The materials have been translated by Pastor Shinga Fidele. Fidele has also been our oral translator. He is also our very cherished friend. We cannot overestimate his value to us and to Global Baptist Training Foundation. When Bruce arrived in Kigali, Fidele told him that God has called him to resign his church, complete his formal degree, and join with GBTF as a trainer. That’s right. Fidele will soon begin training for GBTF! He is a native of Congo and can, therefore, get into this country to continue classes where we cannot always enter. Bruce’s blog today further explains this amazing step forward in training nationals in Africa! Much more to come this week from Rwanda!